(Photo credit: Esther Lin/SHOWTIME) Former WBO 160lb champion Peter “Kid Chocolate” Quillin (32-1-1, 23 KOs) tasted defeat for the first time in his career on Saturday night in getting blasted out by the hard hitting WBA “regular” middleweight champion Daniel Jacobs (31-1, 28 KOs) in a 1st round TKO defeat in a fight between two Brooklyn natives at the Barclays Center in Brooklyn, New York. Jacobs landed a crushing right hand to the head that clearly hurt Quillin, who reacted poorly by backing up to the ropes and attempting to fight back. Sending blood in the water, Jacobs went after the badly hurt Quillin and unloaded everything but the kitchen sink until referee Harvey Dock stepped in and stopped the fight at 1:25 of the round after Jacobs staggered Quillin with a big right to the head. There was some controversy about the stoppage of the fight. Quillin looked like he had regained his footing and was standing firmly on his feet after he staggered accross the ring like a drunk after getting nailed by a right hand from Jacobs. Referee Harvey Dock chose a bad time to stop the fight because Quillin looked like he was ready to continue fighting. But in fairness to the referee, Jacobs would have continued unloading huge punches on Quillin until he went down. 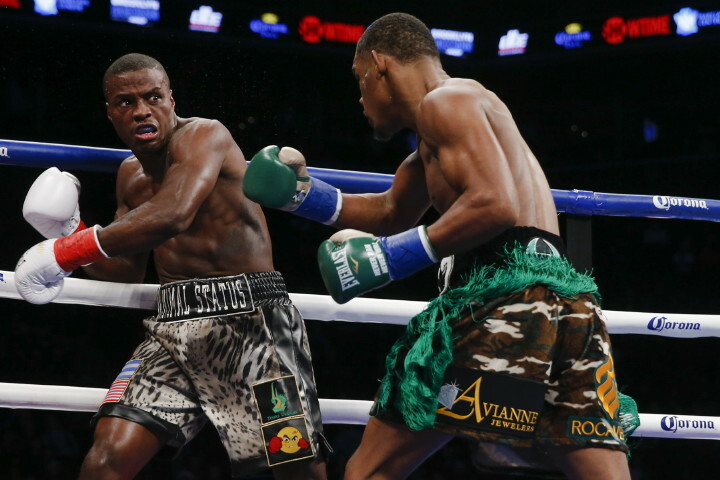 It was clear that there was too much time for Quillin to survive with the way that Jacobs was nailing him with shots. The controversial stoppage could lead to Quillin and Jacobs’ adviser Al Haymon looking to make a second fight between the two fighters rather than having the two guys move on in different directions. Jacobs has a defense due against the winner of the Gary O’Sullivan vs. Chris Eubank Jr. fight, and he might be able to buy some time before having to take that fight if Haymon can apply some pressure on the World Boxing Association to have a rematch take place between his two fighters Quillin and Jacobs.